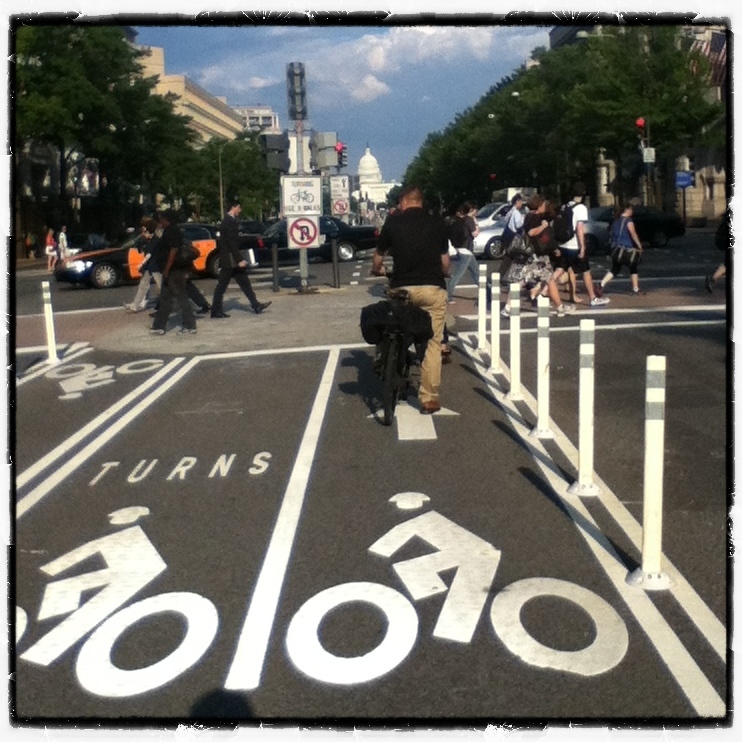 Washington, D.C., welcomed the Pennsylvania Avenue bike lanes to the city in the middle of June 2010. These lanes, as all #BikeDC riders well know, are situated in the middle of Pennsylvania Avenue and run from 3rd to 15th Street Northwest. Pennsylvania Avenue is one of the main thoroughfares of the District, particularly during the week. The stretch of road containing the bike lanes extends from the U.S. Capitol over to the Ellipse, and holds seven or eight lanes of traffic in many spots. It’s a giant road with a two-way bike lane running through the middle of it. I sort of understand that. Before the bike lanes, I rode in the right-most traffic lane and had to contend with all of those issues. However, by placing the lanes in the middle of the street another conflict emerged– the U-turn conflict. Taxis frequently travel Pennsylvania, dropping people off and picking up new fares. In order for them to do that most efficiently, these taxis do not want to take a circuitous route that avoids the bike lanes. Rather, they U-turn through the middle of the bike lane, despite it being prohibited. In addition, cars frequently make illegal left turns at intersections along Pennsylvania which also cut directly through the bike lane. My current office is located one block off of Pennsylvania Avenue and I used to take the bike lanes fairly frequently after work. In my previous job, the most direct route to my office meant a trip down the Pennsylvania Avenue bike lanes. Since the lanes have been put in, people have made illegal left turns right in front of me and executed illegal U-turns dangerously close to me. I do not feel safe in the Pennsylvania Avenue bike lanes so I often avoid them. Over time, it became so frustrating and frazzling to ride on Pennsylvania Avenue that I now either ride in the right-most lane and deal with the conflicts of buses, right-turning vehicles and other bull$h** on Pennsylvania or take one of the quieter side streets along the National Mall to avoid it. 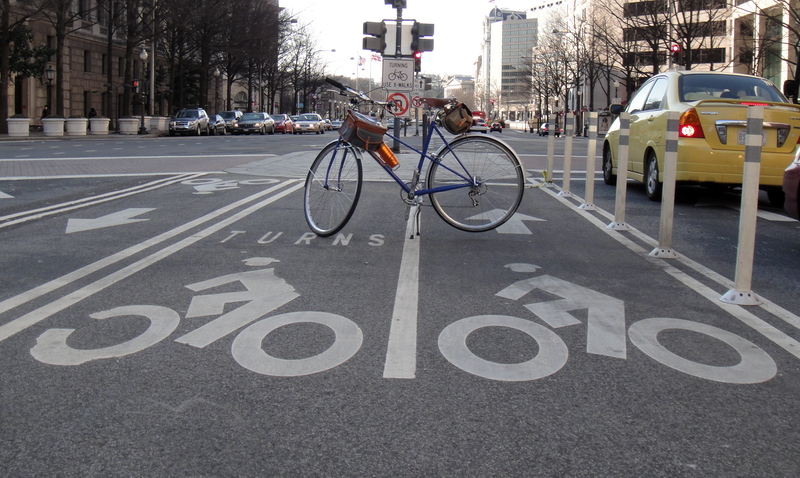 Cyclists and others have clamored for more enforcement of illegal turning on Pennsylvania Avenue, but the city cannot (or does not want to) get a handle on it. BikeDC friends have been hit in this lane and I’ve watched and been part of near misses. Every day, cars continue to make U-turns or illegal left turns through the bike lanes without regard for the cyclists who might be riding in them. @bilsko in the bike lane. Photo by Felkerino/@dailyrandonneur. I am all for improved cycling infrastructure in our city. Bike lanes send a tangible message that cyclists are here and have a place. In addition, I have read that an infrastructure of continuous bike lanes throughout a city (complete streets) helps facilitate more bicycling, and encourages more women to ride because they view the bike lanes as safer than being in the traffic lanes. Previously these lanes were protected by bollards which controlled some of the U-turn riffraff (you can see them in the top two photos), but for some reason they were removed and the District Department of Transportation has not been replaced them; I don’t know why. The result is a bike lane with no bollards in the middle of the road and no physical deterrent to prevent cars from crossing through them. As it stands now, the Pennsylvania Avenue bike lanes are not working for me. I do not feel safe riding in them and I don’t think that I should ride there thinking “One day my time will come and I’ll finally be hit by a car here, oh well.” It’s maddening to feel unsafe riding in one of the few places that is supposedly dedicated to bicycle traffic. Every day, cyclists document illegal turns. I admire their persistence. 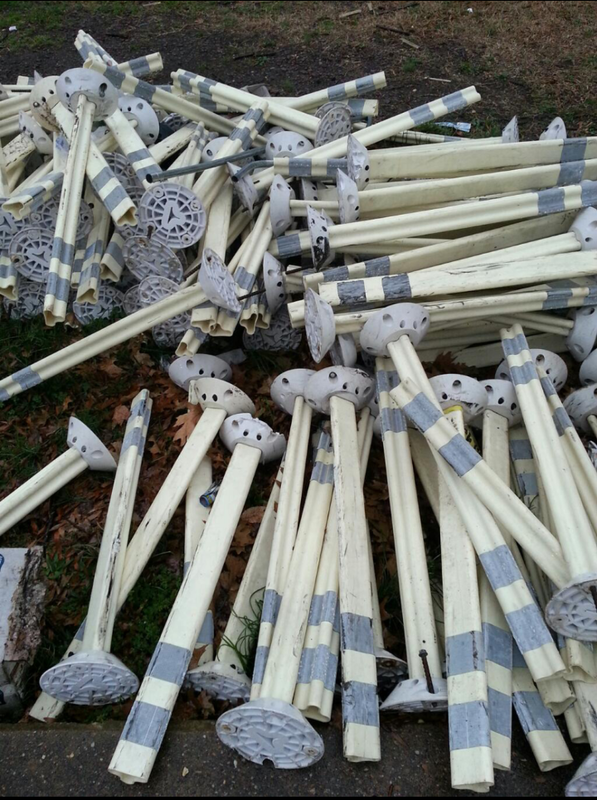 However, the result of people’s efforts so far has not resulted in adequate enforcement or replacement of the bollards. Maybe a few tickets are handed out, but overall behaviors have not changed. People continue to make illegal turns all along Pennsylvania Avenue. Do we continue to fight day after day for this designated space in the middle of the road? Do we ride in the lanes despite the sense of compromise to our safety, or is it time to consider some other kind of change to the Pennsylvania Avenue bike lanes? You tell me because I really don’t know. Like all laws that are current “on the books”… it’s the enforcement that makes them work; and inevitably make our world a safer place to live. Some bollards or a curb would make these lanes much safer, but CFA is more concerned about aesthetics and parades to allow such things to be put into place. I still ride the Pennsylvania bike lanes fairly frequently, and have had a few close calls with u-turning vehicles, most often from vehicles in the traffic lane that had just passed me. Clearly better enforcement will help, but I don’t see that solving the issue. People will still do it regardless of how much it’s enforced. The only real way to prevent u-turning from happening is physical barriers. We need a buffered bike lane for the entire stretch or an actual cycletrack and the only way that’s going to happen is for the cycling population to infiltrate the ranks of CFA and make it happen. I agree w/ you about the enforcement. It would help some, but a physical barrier must exist to keep people from riding in these lanes and to protect the riders. It’s so unfortunate that CFA is averse to doing that. Safety for the sake of aesthetics, you know? Someone “important” has to get hurt before anything will change. Figure out when your least favorite politician will be riding his bike to work (from the limo parked 3 blocks away), and *RUN HIM DOWN WITH YOUR CAR! *Just kidding. Don’t do that. In fact, don’t listen to anything I say. The enforcement that is occurring is inadequate. Last night @jdantos documented 28 illegal U-turns in as many minutes. Unacceptable and totally putting cyclists at risk. Sadly I think the time has come to take back the regular traffic lanes on Penn. I feel much safer riding with traffic and taking the lane — it’s the turns (and car doors) that seem most dangerous to me. 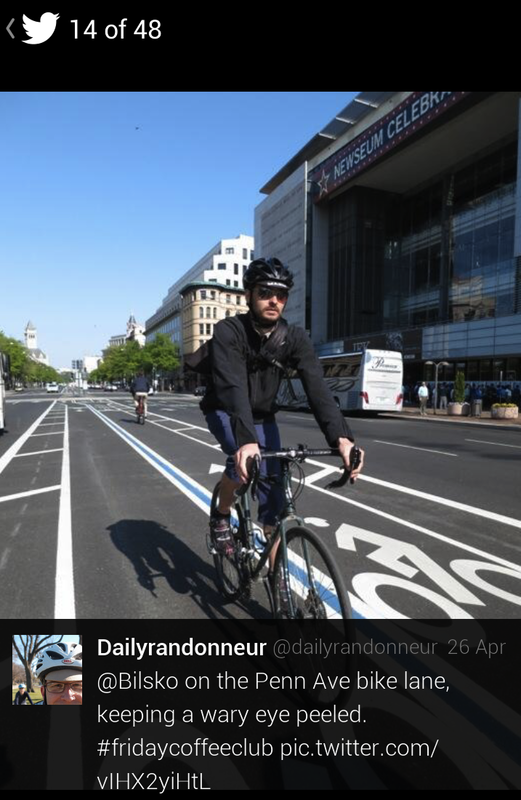 I agree with this 100% If they won’t build infrastructure that actually protects cyclists, and they won’t enforce the laws intended to, then we need to take the streets back – Every Lane is a Bike Lane! Your last paragraph hit the nail on the head. I don’t know the answer either, but my interim response is to document, document, document the severity of the problem, and hope it demonstrates to others that something’s gotta change. I saw that this morning. That is AWFUL and totally unsafe for cyclists! I hope it makes people who can make real change take notice. The current situation is unacceptable. How about putting up bollards except for a spot in the middle of each long block, at which U-turns would be legalized? If people are doing it anyway, there’s something to be said for making it safe to do so.